I’ve just returned from the tenth anniversary Final Cut Pro Supermeet, that raucous and always entertaining and informative gathering of Final Cut Pro users held as an evening event during NAB. This year in front of some 1400 attendees, Apple chose to announce its forthcoming update, Final Cut Pro X. Billed as a “sneak peak”, this hour-long demo began with the obligatory history of FCP, its ground-breaking features and impressive list of users in every production realm from documentary to indie to feature film—and more. FCP X is billed to stress three core elements—image quality, organization and editing all in a redesigned user interface and look. Let’s just cut right to those points both as discussed as well as demonstrated by Randy Ubilos, Apple’s head of video products development and the architect of the earliest version of FCP. The display in FCP X is fully color-managed based upon color sync. It has fully floating point rendering and resolution independent playback from SD to 4K and everything in between. Rendering will be practically a thing of the past as the app will employ unused processor cycles to render constantly in the background. Ingest of media is also to be a background activity with various automatic analyses taking place during ingest. Footage will be analyzed in the background for stabilization. Audio will be analyzed with the option to repair clicks, pops, phase and other audio defects. During ingest, shots will be detected as medium, wide or close and people will be detected—one, two, more, etc. Finally there will be automatic non-destructive color balance during ingest. That leads to the next point—organization. The browser is much more dynamic and relies upon metadata and particularly user-generated metadata. Assign keywords and multiple criteria to clips. Tag those clips and return when needed. Smart Collections is a dynamic means of organizing material based upon multiple criteria. View in clip view. View by criteria. View in filmstrip mode to find a specific shot. It is in the timeline that even more significant changes are seen. Clip Connections is a term to signify primary audio and video locked together with secondary audio. When the clip is moved, all media associated with the clip is moved. That leads to the Magnetic Timeline feature. If a clip or group of clips is moved and collides with another clip, the clip to the right is moved up a track. Want to reduce the clutter on a timeline? Create a Compound Clip which collapses everything into one single clip which then can be edited or moved. Double click the compound clip to edit its components. It is a much more dynamic extension of the “nest” or “pre-comp” depending upon your background terminology. One of the most unique features is Auditioning. Arrange several versions of a sequence for client or director review. Play them all out one at a time. When you or your director or client decide upon the version for the edit, just a keystroke will change the timeline. Enter the Precision Editor. Double click on the seam between two clips and both sides of the material is available to trim. There are audio and video handles within clips in timeline for fades and even retiming. Balance audio levels just by raising or lowering the waveform levels. Secondary audio can be synced with primary audio. No need for a third party application. In both the editing and image areas, Color Matching is as simple as bringing up two clips, clicking and clicking again to match. Speaking of color, color correction has both primary and secondary correctors, complete in secondary with masks which can be manipulated on-screen. Any clip can be expanded in the timeline to show an Animation Graph, a track-like display of all keyframes which can then be modified. And here’s the big one—mix and match clips on a timeline with no transcoding. That’s a pretty basic summary of most of the hour’s key points. And yes, the price and delivery. June 2011, $299 on the App Store. Unheard of! Now it’s time for the questions. My first impression as a Final Cut editor was definitely wow factor. Just the sheer increase in speed alone and its taking advantage of the power of my MacPro while scaling to my two MacBook Pros is awesome. Metadata and clip management looks strong. Yet another concern comes from those who are accustomed to sending their audio out for sweetening and mixing. With these new timelines, is there going to be OMF support for ProTools export? And, in fact, will there even be a Soundtrack Pro or will all or a subset of STP features be bundled into FCP X? Color management is another. What if I don’t want automatic color balancing? I would hope there would be a preference to toggle on or off. The same goes with clip analysis for motion stabilization. Apple is clearly seeking to design an editing system for the future rather than for the past. Editors are often creatures of routine who like to do things fast in the way in which they have become accustomed. Much of the editing metaphor in FCP X is different. Those are changes which will be embraced by younger editors and by the great mid-point of FCP users. Is all of the automation sufficient to drive Apple’s highest end customers to PremierePro or more likely Avid? And these are only a few questions that come to mind after a long day on the NAB floor. And reference video display—what about capture cards? You’ll hear much over the coming couple of months from me and an assortment of writers, bloggers, editors and just general mavens. Let me say that I welcome this upgrade and am excited for the technological advances. I welcome the opportunity to force me out of a rut and in doing so perhaps to think more creatively. I do have conerns. I also realize that some projects may lend themselves to FCP X while others might require Avid. It is all about the right tool for the job and putting NLE fan-boy loyalties aside. Let’s just say for now that I am excited and am keeping an open mind. Thank you, Apple, for once again pushing us to technological and creative boundaries and we look forward to using FCP X. Available of all places from the App Store. Oy vay. 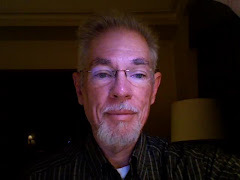 I hereby resolve to work hard at keeping this blog updated and current. The June issue of DV Magazine will feature my article on 3 RAIDS in a range of price and features. I'll be looking at a 2-drive unit from CalDigit, an 8-drive RAID 5 from Sonnet Technology and finally a Fibre-Channel server-level device from Dulce Systems. Due to space limitations in print, I noted that I'll also be reviewing for the web an extension of an 8-drive array using SAS-Expander chassis and controller technology. He is the testing so far. 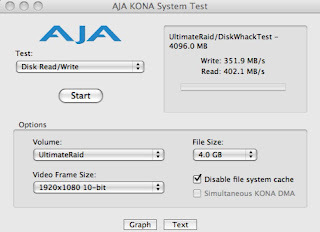 For this test, I'm using another HighPoint RocketRaid 4322 cards, referenced in my Ultimate Raid article here on the blog as well as in DV. The HighPoint 4322 is my choice of RAID controller cards. 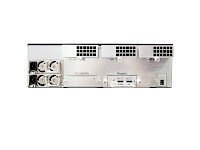 It's dedicated Intel processor is faster than the prior generation; it is expandable with a battery backup daughter card; it supports both eSata and SAS drives through miniSAS 4-channel connectors; it is expansion chassis ready. My tests have already shown that the 4322 is faster than the 3xxx series. And at a price of $599, there is simply nothing on the market that comes close to its price/performance benefits. I'm testing a 16-drive chassis from AIC, the XJ1100, which retails around $1600. It is a sturdy chassis with pop-out swappable drive trays requiring screws to secure the drive to the tray. Unlike many enclosures I've seen or tested, the drives trays are not lockable. The unit is effectively 2 8-drive devices connected internally by an expansion circuitry. 4 miniSAS connectors on the rear allow dual connections to the controller card and dual connections to other 16 drive expansion chassis. Chaining multiple enclosures together can create some significant storage with blazing speed! Like any enclosure of this class the XJ100 contains heavy-duty fans. Heat is, after all, a hard drive's greatest enemy. If you are using this enclosure for editing, you will definitely want to locate it in another room or within a soundproof enclosure. It sounds like a windtunnel. In justfication, however, all large enclosures such as this are noisy as they really are designed to be servers. I'm testing this enclosure with 400gb Seagate Cheetah 15K SAS drives and Seagate 1tb ES-class eSata drives. 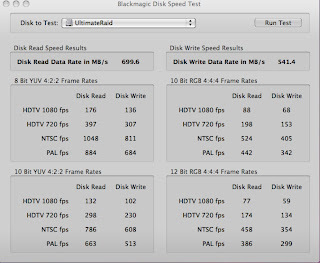 This is a preliminary report on testing the Seagate drives. 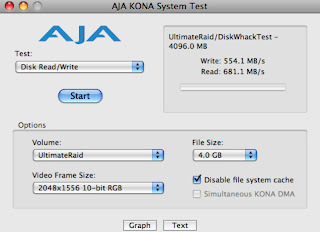 The Seagate Cheetah drives came pre-initialized as a RAID 6 and formatted to a little over 6 tb. Note that 15K SAS drives are not available in the capacities of eSata drives, but the advantages are significant. The SAS drives are built for 24/7 heavy use with 1.6 million hours MTBF. Seagate designs them with specific error-checking algorithms. They are dual-ported, allowing the next drive in the array to take over immediately in the event of failure. For purposes of video, and this would apply specifically if the drives were being used in a SAN configuration, latency is a mere 2ms as opposed to a 4.1ms latency of eSata drives. Because of this low latency and immediate response, EditShare only uses SAS drives in their turnkey SAN systems. I am certain this is the case for other vendors as well. A faster rotational speed will naturally pump data faster and more reliably. Take a look at the AJA System Test results for the Cheetah drives. Note as well that this speed is not just a function of the drives; the RocketRaid 4322 contributes significantly. All I can say about results like that is WOW! To test this in the real world, I copied to the drive several Red R3D files and exported 2K Quicktime files. I brought these into FCP which transcodes the files to ProRes 422 HQ. These 23.98 fps clips played without a single glitch. I also transcoded to Blackmagic 2K 2048x1556 4:4:4 RGB. All footage played without a hitch. Now something else-- I was able to play these files in FCP with scopes open and updating in real time. Even on my 8-drive array, I will sometimes drop frames while playing back live scopes (seems to be a common FCP problem). I always suspected the culprint was drive speed and this array helped prove my point. 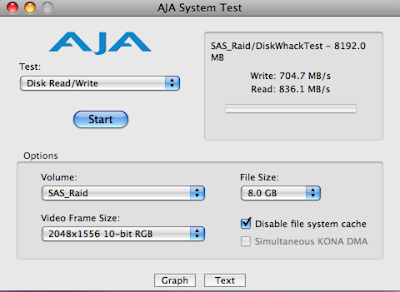 As I write this entry, I'm now initializing a raid using the 16 Seagate ES drives. I'll report on those in the next installment and then the whole article will reprint on DV.COM once my June article appears. Who is the logical customer for this technology? For the RocketRaid card, the answer is any of us wishing to create the fastest raid with parity that relatively little money can buy. The XJ1100 is definitely an enclosure for someone who stores massive amounts of data and needs the luxuries of speed, capacity, and redundancy. As one documentary filmmaker friend who dropped by the studio as I was testing the unit said, "I'd fill this in a year." The Seagate 15K Cheetah drives are suitable for high end work. Their speed and dependability makes them candidates for SAN applications, whether in this enclosure or in another system. Any user loking for the top performance in any hard drive regardless of the system, should strongly consider the Cheetah drives. Keep in mind that the 400gb 15K Cheetahs run in the $525 range. But speed and data security... priceless. Stay tuned for results with the Seagate ES (Enterprise Series) eSata drives. I've been playing with this remarkable composition tool for some months now and honestly have had so much fun with it that I could hardly break away to review it! Muse is an intelligent scoring application which analyzes the color values and other properties of your video and then creates a music bed appropriate to the video. On the surface, it seems quite simple. 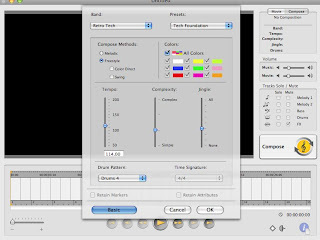 Open a Quicktime movie in Muse and click Compose. A dialog box will appear with choices of 7 different library styles, each with several variations. In seconds, Muse creates a music bed. Don't like it, modify it using keyframes which pop up choices of instruments, volume, transposition, scale or pan. Add a color tracker to alter the score at that timeline point to the color selected. It that basic composition mode is insufficient, click Compose on the main preview window and then click Advanced. Options include style of composition (melodic or freestyle), color tracking options, tempo, complexity and jingle (repetitive elements within the track). When done, export as a wav, aiff or Quicktime file. Bring it into your NLE and sync with the clip. And it's all royalty free. 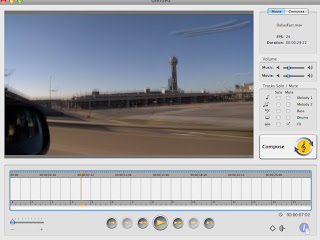 To illustrate, I started with a quick edited sequence of a fast-paced ride through Dallas shot on a Sony EX-1 at 1 fps. Naturally, I would want a fast paced track to accompany it. I selected Retro Tech from the Band pop up and experimented with a few presets, adding a few keyframes and bringing in instruments, fx and some fades. The video seemed to lend itself more to a freestyle composition than a Melodic method, Melodic following traditional more structured rules of composition. In just a few minutes of tinkering, I produced what I consider to be a very fitting music bed. One of the complaints that editors often voice about royalty free music is a certain mundane sameness of the tracks. No one could ever accuse Muse of producing such auditory boredom. It is as if you actually had a composer sitting beside you scoring to the music. Of course, a side value here is if you actually do have a composer, the Muse track can be a guideline to tell your composer "I want something that sounds like this." At $299, it is a bargain. Anyone who has licensed music knows that $299 doesn't go very far in buying clips. And those clips are of stock lengths and don't always match up to the video. Muse produces music beds which just sound like custom compositions and with the almost-infinite variations which can be applied, no two clips ever need sound the same. I would wish that future versions could include a greater variety of libraries and that a preview function of various styles could be added. My other significant wish-list items would be the ability to track luminance values in addition to color as well as to have a color-picker to choose within the video a more exact color. I love it; I commend it to you. There is no other product even remotely like it. Muse is a simple and fun tool to add tremendous value to any production. I've been too busy enjoying my new Sony PMW-EX3 even to post! 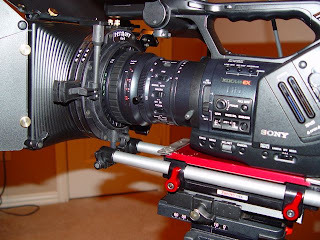 There has been some chatter on the discussion forums that the Sony EX1, EX3 and indeed even Red exhibit an unfortunate trait common to CMOS cameras-- poor rejection of the IR spectrum. This could potentially result in color shifts or inaccurate reproduction of colors. I'll be testing both for this site as well as for a future article on the EX-3 the IR rejection capabilities of the B+W True-Cut 750 IR filter. This new filter is touted by Schneider Optics to be superior to its earlier 486 and 489 IR cutting filters, reducing the potential for a greenish tinge which could potentially occur with the 486 and 489. The IR 750 is currently only available in a 4x4 filter and that meant using a mattebox. The Petroff 4x4 has long been my favorite and courtesy of Petroff, you see a Petroff 4x4 mounted to the EX3 using a lens mounting ring which Petroff developed for the EX1. Petroff had not yet tested the EX3 but I was convinced that there would be no issue with fit since the lenses are identical other than the interchangeable feature of the EX3. I was right. The unit I am testing here is a two stage 4x4 model with optional side wings and a French flag. 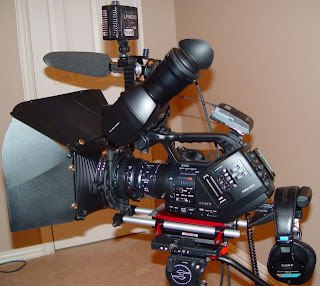 It is mounted with the Zacuto baseplate and rod system, my unqualified favorite plate and worth every penny. Why do I like this product so much? It is sturdy yet lightweight. The mattebox is made from a combination of metal and virtually-indestructable polymide. It has flexibilty while also being able to bend without feeling that you are permanently bending metal. It is modular and can be assembled/disassembled without tools. You can add or remove stages, insert/remove filters, assemble/disassemble the mattebox and not have the need of a screwdriver. Each stage can rotate or be locked in place. In the case of the IR 750 filter, I would not want to rotate the stage. A 4x4 polarizer would be an entirely different manner. Those same thumbscrews over which the lock fits are also the screws you would loosen to remove the filter holder. 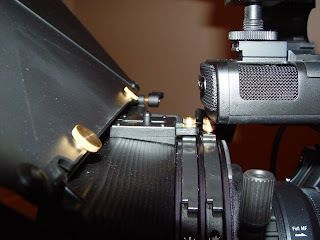 Then it is a simply matter to drop the filter in the holder and return to the mattebox, tightening the screw. Note one concern with the design of the EX1/EX3. That infernal (and, in my opinion useless) built-in mike protrudes too far forward. It does partially block the thumbscrew in the stage closest to the camera. It is not a major issue but a bit of an annoyance requiring deft small fingers or a needle-nose plier to operate the screw. I suspect it might be possible to design a donut to extend the entire assembly slightly. Petroff does manufacture a "universal" mattebox designed for Sony HDV cameras where the built-in mike constitutes a more significant issue. EX owners might want to consider this universal model. In this shot, note how tightly the mattebox components fit together and how securely the lens adapter, large lens mount screw and rod attachment both hold the mattebox together as well as secure it to the Zacuto baseplate. No light leaks, no wobbling, secure snap in filter holders give the user of this mattebox complete confidence that it is doing what a mattebox is supposed to do-- light control, hold filters, and fit securely to the supporting rods. The Petroff mattebox accomplishes all of these tasks and then some. The P44 two stage as shown lists at $1370. Follow-focus is also available. Check out the baseplate, rods and tons of other related accessories at www.zacuto.com. Conveniently enough, Zacuto is also a Petroff dealer. That's the mattebox part of this installment. Will start shooting with the filter in the coming days to determine whether the IR problem is pervasive or just infrequent. Highpoint Technology has updated the firmware for the RocketRaid 3522 to allow booting from Mac OS X 10.5. Now, this is not quite as significant to the video editor since we would not be capturing to a startup volume, but it is a significant advance in the evolution of the RocketRaid card for those users who require large start-up volumes. This is one impressive raid card. Bootable (for those whose applications need bootable raids), easily updated via firmware patches, ethernet port for remote control of raid and computer functions, multiple raid levels, optional battery backup, but most importantly its Intel IOP 81341 on-board processor. 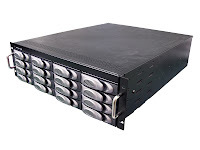 It is a true hardware raid controller with all of the speed, security and management capabilities that any editing installation would demand.